Bring the power of PlasmaGlow Technology to your interior with Color changing LED Glostix Tubes! Connect them to your existing 2.1 million Color digital control box and watch the bright colors cycle and move for a fantastic light show in your vehicle! You can also combine these LED Tubes with our new "2.1 million Color Under Car Kit" for an unmatched show of light! The color changing GloStix tubes feature all 14 modes, 11 speeds and display all 2.1 million colors in one tube! All you need, in order to run these Glostix tubes, is a 2.1M color LED Digital control box *OR* a 2.1M Color changing LED Undercar Kit, (which allready has the Digital Control Box in the kit), and your ready to go! Or you can purchase both the Glostix & the Digital Control Box as a Package and SAVE! * 2.1 Million colors in one tube! 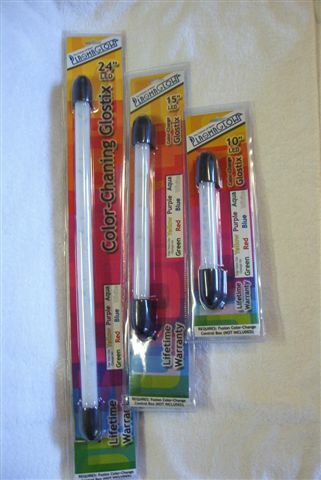 The Color changing LED Glostix Tubes come in three different sizes of 10, 15, and 24 inches. Color changing LED Glostix Tubes- Back to home page.